Vizit has been a leading SharePoint ISV since 2008 offering solutions for file preview and viewing, capturing paper and enhancing images, extending SharePoint search and collaboration, and integrating visual content with SharePoint workflow for document review, annotate and comment. 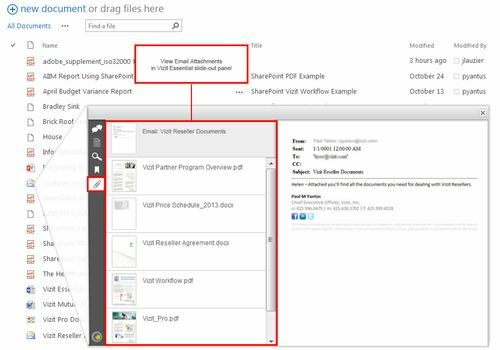 Vizit products will change how you find, share, and collaborate on content in SharePoint documents. Our SharePoint search product and our SharePoint social collaboration tools offer configurable solutions. Vizit provides better SharePoint search, document management, and social collaboration. Make the most of your SharePoint investment and drive user adoption with Vizit. Give your users great tools to find, view, collaborate on, and protect SharePoint documents fast! Vizit provides solutions that enhance SharePoint usability, SharePoint search, and SharePoint document reviews and we’re pleased to announce the general availability of Vizit 6. This latest release of Vizit builds on our core legacy of providing world class previewing and viewing solutions for Microsoft SharePoint by enhancing Vizit Essential’s PDF & Email capabilities, and greatly expanding Vizit Pro’s annotation capabilities. By popular demand Vizit 6 also extends thumbnail previews to SharePoint 2013 Document Libraries for both Vizit Essential and Vizit Pro. Vizit Essential has always provided the ability to quickly view email messages in SharePoint (Vizit supports .msg, .eml, .emlx file types). Now users can view and navigate email attachments as a natural extension of viewing an email message in SharePoint. A new slide-out panel has been added to Vizit Essential which provides a thumbnail preview of all email attachments. Users open the panel by selecting the familiar paperclip icon, and can open any attachment by simply clicking on its first page preview. 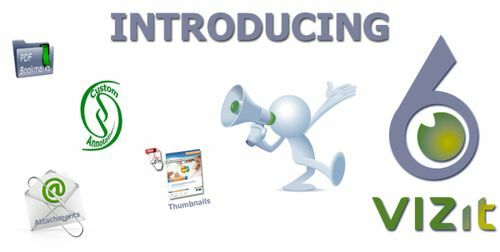 Vizit Essential greatly improves SharePoint 2013 usability by extending the platforms preview and viewing capabilities with important formats including PDF, Email (.msg, .eml, .emlx), TIF, DWG and hundreds of other file types. Vizit Essential & Pro also now provide hover-over previews within SharePoint 2013 document libraries. 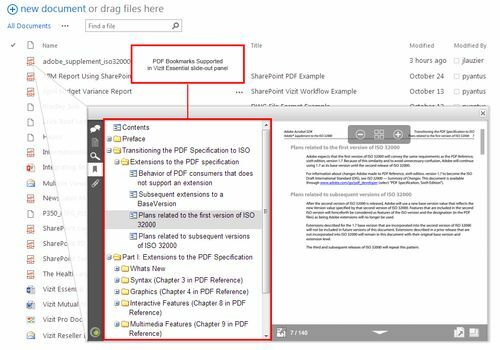 Users can simply place their mouse over the file type icon in any SharePoint library where Vizit is enabled to see the first page of a document. Clicking on this icon launches the Vizit Essential or Pro viewer for full file access. A new slide-out panel has been added to Vizit Essential enabling users to navigate PDF documents using existing bookmarks. Support of PDF bookmarks adds another method for users to navigate directly to what the user seeks in SharePoint files. Vizit conducted a survey of over 1,200 organizations using SharePoint that revealed most SharePoint file searches seek something more granular than the file itself. This is typically a key exhibit or passage. PDF bookmarks provide an additional navigation method for users to locate the information. The latest addition to Vizit Pro’s API adds support for custom annotations. Integrators can now register a plugin through PowerShell or a console program with Vizit Pro. Whenever the user selects the custom annotation in the Vizit Pro interface, Vizit Pro passes a .NET graphics object to the associated plugin to draw the result. 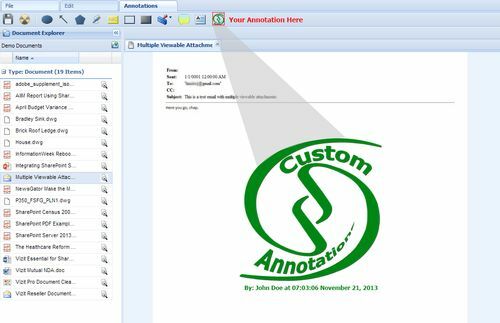 This enhancement provides an unlimited number of annotation possibilities to integrators and their end users. Now, you can protect your content like never before with Vizit’s new Digital Rights Management feature. With the click of a button, you can prevent users from downloading files in SharePoint while still providing them with the tools to get their work done. Simply activate the Vizit DRM feature and users in your configured groups will be brought to a read-only view of documents in Vizit — even when they access the document directly via its URL. With the introduction of this release Vizit Essential can now be deployed to take over document links in SharePoint 2013 document libraries to provide a quick view versus a download of a file. Vizit 6 adds a SharePoint 2013 site level feature to Vizit Pro for adding a ribbon button and drop down menu item. Vizit Pro also has a new full screen thumbnail mode for splitting and merging large documents.